Coronary heart disease (CHD): In order to avoid CHD a low-fat, high-fibre diet is recommended, to prevent high blood pressure and high cholesterol levels, two main factors which could cause CHD. Cancer: ‘Through scientific research, we know that our risk actually depends on a combination of our genes, our environment and aspects of our lives, many of which we can control.’ Reference taken from: Cancer research UK website, ‘Can cancer be prevented’ page, updated April 2014. So although genetically we cannot guarantee whether we suffer from cancer or not, this reference suggests there are things we can do to minimise our chances. Not smoking, limited alcohol consumption, staying safe in the sun and leading a healthy lifestyle are just a few. Stroke: In order to reduce the risk of a stroke we should: avoid smoking and second-hand smoke, eat foods low in fat, cholesterol, sodium and added sugars, check blood pressure often and decrease stress levels, where possible. Diabetes: Eating healthily, exercising and maintaining a healthy weight, in both type one and type two diabetes is crucial to ensure the condition is well controlled or for type two diabetes, prevented. High levels of glucose in the blood is the main cause, therefore a healthy lifestyle which is low in sugar, is strongly advised to minimise the condition. Should it not be controlled adequately then many further complications could be experienced. High blood pressure (HBP): There isn’t always an explanation for HBP, however not exercising regularly, being overweight, consuming too much salt in your diet, drinking too much alcohol and having family history of BPHBP are all factors. Suffering from HBP can lead to the risk of suffering from coronary heart disease and a stroke. Chronic obstructive pulmonary disease (COPD): The main cause of this progressive disease is smoking, and usually affects people over 35years of age, who are or have been heavy smokers. So leading a healthy lifestyle and refraining from smoking will significantly reduce the risk. Overall eating healthily, exercising regularly, maintaining a healthy weight and BMI, limiting alcohol consumption and not smoking will ensure the risks of chronic illnesses and diseases is minimised. Family history can sometimes be a major factor when suffering from any chronic illness or disease, it is believed that the above measures can be taken to minimise the symptoms. A nutritionally balanced plate should be proportioned as the pie chart shows. 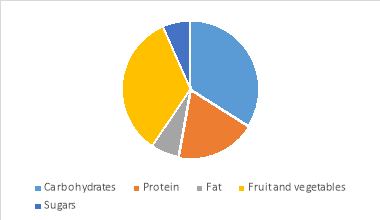 I have created this pie chart based on information I have read in my study guide and from http://www.nhs.uk/Livewell/Goodfood/Pages/eatwell-plate.aspx. Information obtained from NHS choices ‘The eatwell plate’ as of June 2014. Carbohydrates make up quite a large section on diagram above, this is because they contain essential nutrients, and in wholegrain varieties, are a good source of fibre, which in turn is essential for effective bowel function. Carbohydrates are foods such as potatoes, bread, rice, pasta and other starchy foods. Meat, fish, beans, eggs, milk, and other dairy products are protein rich foods. Alike carbohydrates, these foods are a great source of essential minerals and vitamins which are necessary for good growth of body cells. Dairy products are a great source of calcium, which helps keep bones and teeth strong, which is essential especially for children whilst they are still growing. Some fat is necessary in our diet, particularly unsaturated fat, as this is a ‘good’ source of fat, because it helps to lower cholesterol levels in our bodies. Unsaturated fat, such as omega 3 is found in: oily fish, nuts and seeds, sunflower and olive oil and avocados. Saturated fats are ‘bad’ as they can cause high cholesterol levels, which built up over time can cause heart disease. However these can still be enjoyed in moderation. Foods high in saturated fat include: fatty cuts of meat, butter, lard, cheese, cream, chocolate, biscuits and cakes. At least five portions of fruit and vegetables should be consumed per person daily, by doing so the risk of suffering from a stroke, heart disease and some types of cancer may be reduced. Also fruit and vegetables are a great source of vitamins, minerals and fibre, therefore helps the digestive tract to work efficiently. Sugar naturally occurs in foods such as fruit and milk, but it’s not these sugars that we need to cut down on – it’s food with added sugar that we need to consume less frequently. Such as sweets, fizzy drinks, cakes, chocolate and biscuits. These foods alike unsaturated fat should be consumed in moderation. Eating too many foods high in sugar can cause weight gain, which in turn can lead to conditions such as heart disease and type-2 diabetes. There are many activities that can be carried out with young children, which contribute towards a healthy lifestyle. Below I have chosen three that I believe are particularly important and fun! They are favourite activities of the children whom I nanny for. Firstly cooking: the kitchen is the main ‘hub’ of the house, the children’s favourite place to be. Whether the children are old enough to be helping or sat in their highchair watching, I believe children are never too young to be in the kitchen and learning. Every day at least twice a day they will be there offering their help. They enjoy chopping vegetables (with child friendly knives of course), weighing and measuring ingredients, stirring and mixing and even washing up! All of which I believe are some great life skills, that will endeavour that they grow up independent and knowledgeable. Cooking obviously contributes towards a healthy lifestyle when cooking healthy meals and generally the children will eat more when they know what the ingredients are and have helped to prepare it. To enhance social, emotional, intellectual and physical development. And thirdly: Physical activities. A trip to our local park is both beneficial for the children and myself. From leaving the house to walk to the park, the children are constantly learning and evaluating situations and there consequences. Firstly by being aware of the space around them (generally the children are on bikes/scooters), and the roads, of which we have to evaluate and discuss a safe crossing time/space. The children benefit from this enormously by learning about spatial awareness, riding/scooting independently on paths and the ‘stop, look and listen’ method when crossing the roads. Then physically they’re benefitting from the exercise to and from the park and the time spent at the park. Most days I aim to get the children to be as active as possible, by encouraging outdoor play, as well as partaking in extracurricular sports/activities that they already attend. I believe these three activities provide children with enough creative, imaginative and physical benefits to contribute towards a healthy lifestyle. I believe wellbeing means different things to different people. For me the definition of wellbeing is split into three parts: social and emotional, mental and physical. A child’s wellbeing starts at home, from the very first day they’re born. Maintaining wellbeing in families is imperative for both children and adults. Socially and emotionally I believe it means to be content, happy and loved, not only by yourself but by the people around you. Meaning it is important for a child to feel safe and secure with their family and friends, providing a loving environment, ensuring consistency and keeping to a routine can provide this safety and security. It is important that a child should feel able to express their emotions and concerns with a family member, so I believe it is important to spend quality time with each child individually, to make them feel they have their own opportunity to discuss and show their emotions. Equally it is then important to build a special bond with your child so they feel like they have someone they trust to do this with, being supportive of each other along the way and developing their self-esteem and self-worth. And mental wellbeing, alike social and emotional, means to be happy and living in a way that is good for you and good for others around you. To have good relationships that bring joy, with the people around you. And to feel contentment, enjoyment, confidence and engagement with the world are all aspects of mental wellbeing. To achieve good metal wellbeing you need to connect with the people around you, e.g. your children. Spend time developing and working on these relationships. Teaching your child a new skill such as riding a bike, continue to let them learn and praise and encourage where necessary. Also taking notice and being aware of the present moment can help, taking time to think about the world around you and your feelings and thoughts. Encourage your child to do the same. And finally I believe being active has a huge impact on our metal health. For me personally it’s running, taking 30minutes out of a day to think of nothing but running, helps to clear my head and focus on what’s important in life. I believe it’s also very beneficial to children as it is adults. And finally physical wellbeing: I believe it means to be healthy, safe, and physically fit. To maintain good physical wellbeing a parent’s role is imperative as a child can’t necessarily ensure they are leading a healthy lifestyle alone. To achieve good physical wellbeing parents should make sure healthy meals are made and that they are encouraging their child to take part in regular physical activity. To maintain a child’s health and safety they should be free from illness, injury and pain. To achieve this regular health checks should be made with the doctor, as well as when an illness/injury may occur. Also keeping a watchful eye to minimise injury is also very important. A child who is in a child care setting, will be evaluated regularly to identify any signs of emotional or social difficulties affecting their wellbeing. If any signs are noticed at home or parents want to be aware of addressing health and wellbeing issues or to discuss any current issues, they can request to attend a workshop which is available to parents, where possible. "Benefits of Leading a Healthy Lifestyle for Children." UKEssays.com. 11 2018. All Answers Ltd. 04 2019 <https://www.ukessays.com/essays/nutrition/benefits-leading-healthy-lifestyle-4415.php?vref=1>. "Benefits of Leading a Healthy Lifestyle for Children." All Answers Ltd. ukessays.com, November 2018. Web. 24 April 2019. <https://www.ukessays.com/essays/nutrition/benefits-leading-healthy-lifestyle-4415.php?vref=1>. UKEssays. November 2018. Benefits of Leading a Healthy Lifestyle for Children. [online]. Available from: https://www.ukessays.com/essays/nutrition/benefits-leading-healthy-lifestyle-4415.php?vref=1 [Accessed 24 April 2019]. UKEssays. Benefits of Leading a Healthy Lifestyle for Children [Internet]. November 2018. [Accessed 24 April 2019]; Available from: https://www.ukessays.com/essays/nutrition/benefits-leading-healthy-lifestyle-4415.php?vref=1.